The reimagining of Jane Eyre as a gutsy, heroic serial killer that The New York Times Book Review calls "wonderfully entertaining" and USA Today describes as "sheer mayhem meets Victorian propriety." "A thrill ride of a novel. A must read for lovers of Jane Eyre, dark humor, and mystery." A sensitive orphan, Jane Steele suffers first at the hands of her spiteful aunt and predatory cousin, then at a grim school where she fights for her very life until escaping to London, leaving the corpses of her tormentors behind her. After years of hiding from the law while penning macabre "last confessions" of the recently hanged, Jane thrills at discovering an advertisement. Her aunt has died and her childhood home has a new master: Mr. Charles Thornfield, who seeks a governess. Burning to know whether she is in fact the rightful heir, Jane takes the position incognito and learns that Highgate House is full of marvelously strange new residents--the fascinating but caustic Mr. Thornfield, an army doctor returned from the Sikh Wars, and the gracious Sikh butler Mr. Sardar Singh, whose history with Mr. Thornfield appears far deeper and darker than they pretend. As Jane catches ominous glimpses of the pair's violent history and falls in love with the gruffly tragic Mr. Thornfield, she faces a terrible dilemma: Can she possess him--body, soul, and secrets--without revealing her own murderous past? A satirical romance about identity, guilt, goodness, and the nature of lies, by a writer who Matthew Pearl calls "superstar-caliber" and whose previous works Gillian Flynn declared "spectacular," Jane Steele is a brilliant and deeply absorbing book inspired by Charlotte Bronte's classic Jane Eyre. Lyndsay Faye pulls off the most elusive feat of historical fiction: to give us a book that reads as though it was unearthed from a perfectly preserved antique chest. Sneakily charming and wildly well written, like Faye's other novels JANE STEELE demands attention. "Witty and exquisitely plotted, this is such a delectable treat 'tis a pity it has to end." "[Jane Steele's] crimes are wonderfully entertaining." "An entertaining riff on Jane Eyre...sheer mayhem meets Victorian propriety." "Jane Eyre gets a dose of Dexter. In a story that's equal parts romance, thriller, and satire, the Bronte heroine is made over into a fighter with a shadowy past." "Delectable...Bronte fans and unfamiliar readers alike will be sucked into Jane's rich story, filled with love and secrets a plenty. This book will take you on a dark and unforgettable journey." "Jane Steele is the hard-edged Jane Eyre you never knew you wanted...A Jane Eyre for our age, with a heroine who can wield both a knife and a well-placed insult. That her crimes are endearing instead of alienating is both a tribute to Faye's deceptively charming style and to Jane's sturdy yet pliant moral code. Who could begrudge a few casualties when you're having this much fun?" "This book scratched all my favorite itches: Victoriana, feminist rage, and excellent, gut-punch sentences. You'll love this Jane just as much as you love the original." "Faye's skill at historical mystery was evident in her nineteenth-century New York trilogy, but this slyly satiric stand-alone takes her prowess to new levels. A must for Bronte devotees; wickedly entertaining for all." 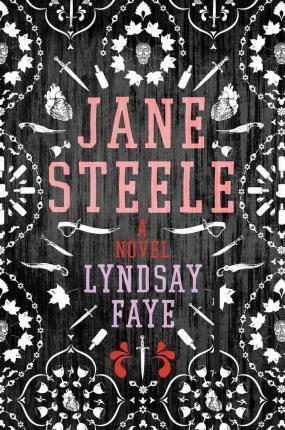 "Young Jane Steele's favorite book, Charlotte Bronte's Jane Eyre, mirrors her life both too little and too much...In an arresting tale of dark humor and sometimes gory imagination, Faye has produced a heroine worthy of the gothic literature canon but reminiscent of detective fiction." "Let's be honest here. When I was sent an advanced readers' copy of JANE STEELE, which was billed as an historical crime novel with a Jane-Eyre-style heroine who becomes a serial killer, I thought someone was pulling my leg. I decided to read ten pages, just to annoy myself as I'm often inclined to do. Also, to show what a good sport I am. I was hooked by page five and read my way through at a merry clip. I loved this book! The language rings true, the period details are correct. Jane Steele is a joy, both plucky and rueful in her assessment of her dark deeds. The plotting is solid and the pacing sublime. If this were a series, this would be the perfect introduction. As a stand-alone, I give it an A+"
"This is a wonderfully wicked book. The deadly first chapter actually made me gasp. Jane Steele is a character you will not soon forget. Great evil fun!" "I've just read the next best thing...Enhanced by truly original and poetic turns of phrase...throughout its compelling narrative, Jane Steele pleas for a comfortable chair, a crackling fireplace, and an ideal adult beverage to guarantee a thoroughly pleasurable winter evening." --Otto Penzler, Owner of The Mysterious Bookshop "JANE STEELE is lethal good fun! In Jane, Lyndsay Faye has created a heroine unwilling to suffer tyrants or fools. The result is a darkly-humorous, elegantly-crafted story of an "accidental" vigilante. A delicious read." "Enchanting. JANE STEELE is beautifully rendered and utterly captivating, from the first cry of "reader, I murdered him" to its final pages. Lyndsay Faye is a masterful storyteller, and this is her finest tale yet." "JANE STEELE is the book I never knew I always wanted to read. Gripping, twisty, and fiendishly clever, JANE STEELE picks you up by the throat and never lets you go, taking you on an exhilaratingly wild ride. I haven't enjoyed a book this much in ages--the only thing it left me wanting was MORE Jane Steele!" "From the gasp-inducing moment Jane Steele utters the words "reader, I murdered him," you know you are in for a rollicking romp of an adventure that recasts the Jane Eyre story in an entirely new light. But mixed in with the verve and vivacity is a story of real heart, exemplary, near-forgotten history, and an utterly unforgettable heroine. Brava to Lyndsay Faye for what's already one of my favorite thrillers of the year." "Add Jane Steele to that club of unforgettable antiheroes--Tom Ripley, Hannibal Lecter, and Dexter Morgan--who do dreadful things to bad people. Bold, inventive, and charmingly wicked, this instantly addictive novel pays homage to Jane Eyre while being wholly original. Lyndsay Faye has created a masterpiece." "Jane Steele is a bold and imaginative undertaking -- wickedly entertaining and exquisitely unique in its execution...With thrills, mystery and romance, the story is striking and imaginative as we see how Bronte's Jane Eyre gives meaning to Jane's acts. Dark, satirical humor coupled with sharp dialogue make this a novel that's refreshingly compelling." "Hand to my heart, this book positively made me swoon...JANE STEELE is an homage to Jane Eyre, yet infinitely better, since Jane Steele is no one's victim; she bends life to her will instead of drifting along according to fate's whimsy...Jane is a thrilling protagonist...I wish that I could read this again for the first time--but I've no doubt it will be just as good when I read it for the third and fourth times." "For anyone who read "Jane Eyre" wishing for swifter, more final fates for the cruelest characters, Jane Steele is here to grant your wishes...a fresh and imaginative takeoff on "Jane Eyre," and will leave readers with plenty of fodder for discussion." "[Faye's] writing crackles with wit, conveying a hip 21st-century sensibility while remaining true to Bronte's vision...and her historical research and thoughtfully drawn characters make "Jane Steele" a compelling page-turner." "Faye hasn't embarked on a retelling of Bronte's masterwork, or anyone else's, for that matter. Her novel pays homage to the greats, yet offers a heroine whose murky past and murderous present remind us that some female behavior in other eras never made it into print...The satisfaction in this novel is its conviction that the self is enriched by an understanding of others, whether their motives are villainous or amicable." "A beautifully written, thoroughly engaging and brilliantly satirical novel...Jane Steele is an extraordinary, likeable narrator, and Faye's other characters are just as memorable. The sharp and tragic Mr. Thornfield gives Bronte's Mr. Rochester a run for his money. This book, whether you're trying to puzzle out the mysteries or just lapping up Faye's brilliant humor, is an excellent homage to Bronte and simply a treasure on its own." "A smart satirical gothic romance that plays as much to Charlotte Bronte's fans as Edgar Allan Poe's... Flushed with humour and humors, this novel is a hoot. I laughed not only at Jane's audacity as a character...but also the author's accomplishments skillfully mashing up a modern serial killer novel with a 19th-century novel of manners."